Who Should Do the Toes to Bar? There are two main toes to bar variations, strict and kipping. Both of which are discussed below. Note, that the below step-by-step- guide will go over how to perform the strict toes to bar version). Once you have mastered the strict version, you can then add the kipping movement. 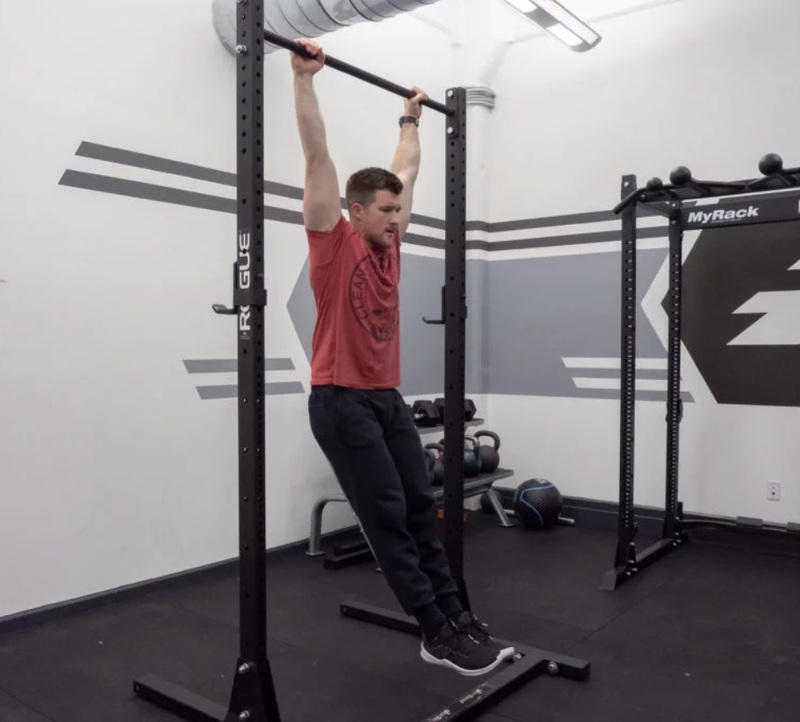 Strict Toes to Bar: Strict toes to bar are some of the hardest exercises you can do for core strength and development (if you truly do it strict). By increasing your strength, coordination, and control of this movement, kipping toes to bar should be breeze once you build up the endurance and skill of kipping. If you choose to go directly to kipping toes to bar, and never address your ability to do the basics correctly, you could be setting yourself up for stalled long term progress and injury. Below is a brief exercise tutorial on how to perform strict toes to bar. 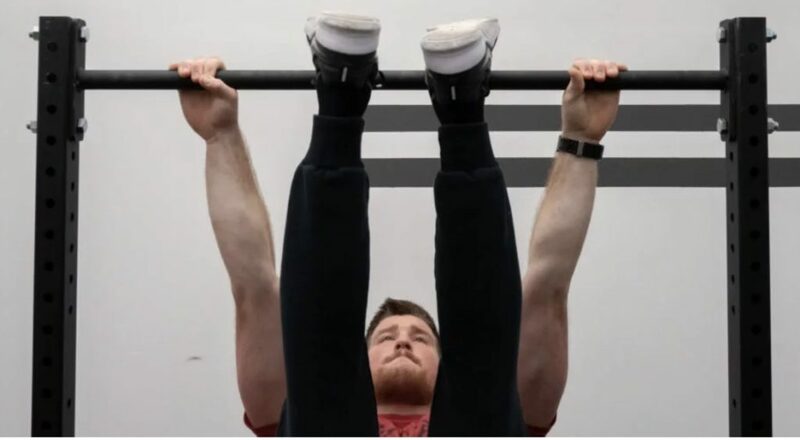 Kipping Toes to Bar: Kipping toes to bar are commonly seen in competitive fitness, CrossFit, and gymnastics; all of which are a ballistic movement that requires basic core strength, coordination, midline stability, and good amounts of mobility in the shoulders, thoracic spine, and pelvis. Below is a brief exercise tutorial on how to perform kipping toes to bar. 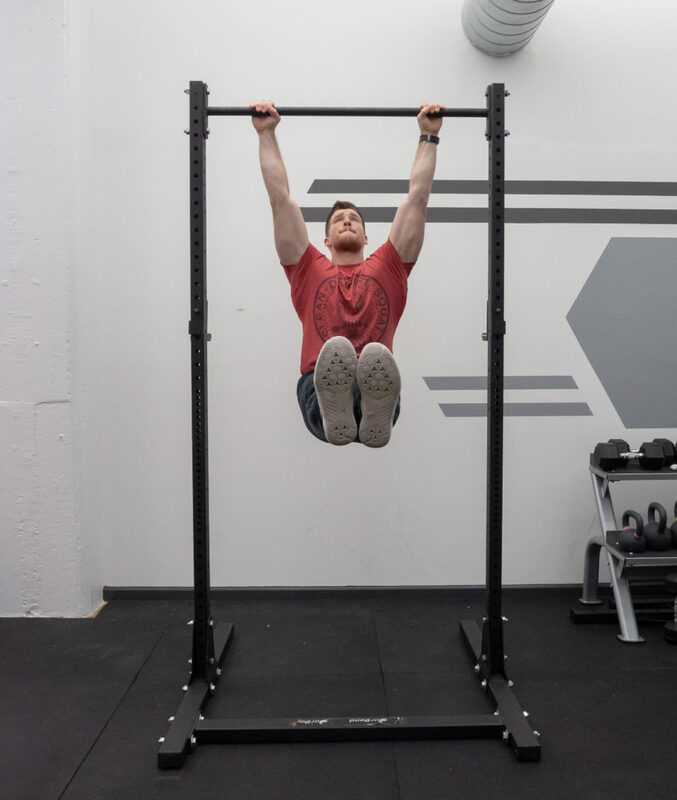 Start by hanging from a bar with the hands slightly wider than shoulder width apart. The thumbs can be wrapped or unwrapped, with the head cradled in between the biceps. It is vital to maintain midline stability, by pulling to belly-button into the body, squeezing the legs and glues together, and pointing the toes. Coach’s Tip: Think about pulling the bar downwards, so that your scapulae are depressed and slightly retracted (like a scapular pull up). This, in addition to keeping midline stability, will minimize swinging of the torso. This is a quick step, however without it you will be missing out on some powerful assistance from the back muscles. Actively pull hard on the bar, so that you are thinking of leaning back and lifting the chest upwards as you begin to lift the legs (step 3). Coach’s Tip: Stay tight in this position, and as you get fatigued be sure to pull down harder onto the bar for assistance. Think, pull down to go up! Just like the step implies, squeeze the legs, thighs, big toes, and glutes together as you lift the toes to the bar. Thinking about keeping your body in one straight line (from the front view) is key. Coach’s Tip: If you are having issues doing this strict, be sure to first pull back harder onto the bar and then, if still need, as for assistance from a friend. As you approach the top of the movement (either with straight legs or bent knees), you will need to make one more final effort to kick the toes towards the bar. Be sure not to hurt yourself in the process. Kicking, or rather, flicking the toes/feet to the bar can add some much needed momentum (don’t use this step if you are doing these strict). As you descend, be sure to push your body forwards (since you were pulling back on the bar in step 2). Additionally, make sure to keep the legs pressed together and toes pointed as you control the lowering aspect. Whatever you do, do not simply lose tension and flop the legs downwards. Not only will this kill all momentum and body positioning, it can also add excessive flexion and extension to the lower back. Below are a few benefits on toes to bar (both strict and kipping). If a benefit is inherent to a specific style of toes to bar (strict or kipping) it shall be noted below. Whether done strict or kipping, the core will be forced to become stronger. I generally recommend strict toes to bar to increase fundamental strength and control, only adding kipping after the athlete is well-versed with strict toes to bar. In the event strict toes to bar movements are not doable with beginners or other populations, strict knee to chest, knees to elbows, knee raises, or partial toes to bar can be done to slowly progress lifters towards the fuller version. Like any movement, increasing the volume and metabolic demands on a muscle tissue will result in a great ability to promote muscular contractions under high amounts of fatigue. Not only is that a reason for muscular hypertrophy, it also can be helpful for endurance athletes, runners, and other fitness athletes looking for greater core and midline control under load and/or fast ballistic movements (sprinting, sports, CrossFit, etc). Simply hanging from a barbell for prolonged periods of time can do wonders for your grip training and upper body muscular endurance. Add in ballistic style kips, or even strict toes to bar, and you have a recipe for serious pulling and gripping potential. Kipping will drastically increase this demand as it will allow for faster repetitions, greater demands of control, and even prolonged periods of time under tension. Toes to bar are a challenging movement (both strict and kipping) for the body: Below is a listing of the various muscle groups that are targeted It is important to note that kipping increases the demands on grip, shoulders, and back muscles, as well as overall muscle damage due to the vast increase in eccentric strength and control needed in order to perform repetitions in a cyclical, ballistic fashion. Who Should Perform the Toes to Bar? The toes to bar can be done as a strict or ballistic based core exercise, both providing benefits to strength, power, and fitness athletes. Strength and power athletes can use toes to bar (strict or kipping) to increase core strength, midline stability, enhance grip strength, and help to increase overhead/thoracic mobility. Powerlifters: The omission of overhead lifts from the competitive lifts (despite most powerlifters training shoulder presses) could result in stiffer shoulders and limited range of motion (due to tight lats, lack of overhead work, etc). 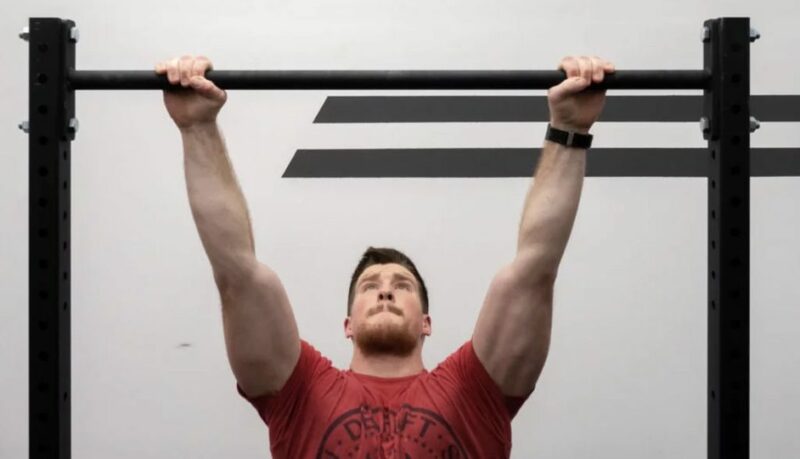 Using the hanging toes to bar, in its strict form, can be a good way to integrate core, grip, and overhead mobility training. Strongman Athletes: Similar to powerlifters, increasing core strength, midline stability, and stamina of the grip and core muscles is key for maximal performance when under load. While this often means performing more sport specific movements, the toes to bar can be used to help increase core and grip strength/endurance without added spinal compression. 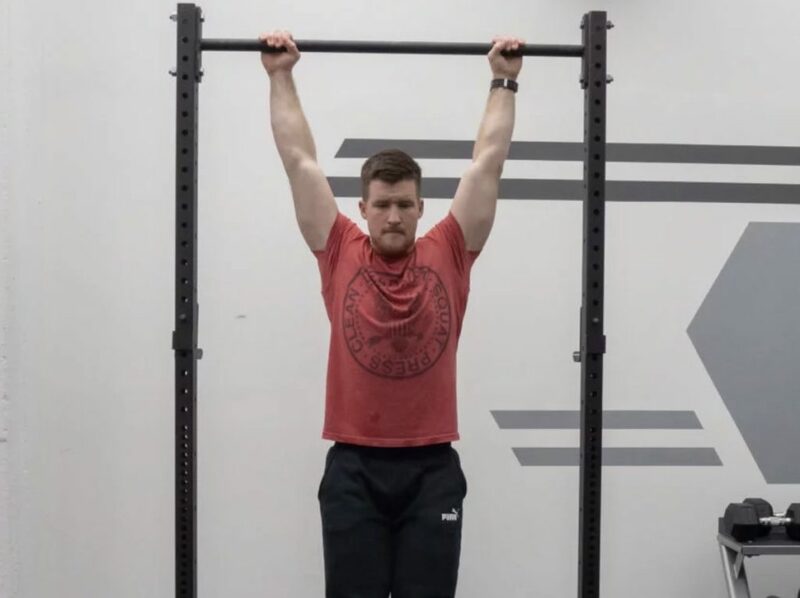 Weightlifters: Olympic weightlifters can use this exercise to increase core strength, achieve midline stability in the arms overhead position, decompress the spine (strict versions with long hangs), and increase thoracic mobility/scapular stability. In addition to the above benefits for strength and power athletes, the toes to bar exercise (both kipping and strict) is a sport specific movement for CrossFit and functional fitness athletes. This can be used to increase gymnastics abilities, toes to bar performance in WODs, and/or increase core strength and stamina. The toes to bar movement (strict or kipping) is an advanced exercise to increase core strength, midline stability, and enhance general bodyweight and gymnastics abilities. Below are three primary training goals and programming recommendations when programming toes to bar into workouts. Note, that these are general guidelines, and by no means should be used as the only way to program toes to bar. Depending on the goals of the athlete (movement skill, core strength, endurance), the coach should input this exercise accordingly into the regimen. Skill and strength based goals often result in the toes to bar being perform earlier in a workout session, with core endurance being found later after main strength, power, and skill work. You can increase loading by holding a light dumbbell between the legs, working against a partner (manual resistance), or against a band. In addition to increasing loading/manual resistance, using tempos and isometric holds at various points throughout the range of motion can increase time under tension and muscle activation. Below are three (3) common toes to bar variations that can be done to improve toes to bar performance/skill, increase core strength, and more. The kipping toes to bar is done by adding a kipping movement (like the pull-up) into the movement. In doing so, you use the momentum gained from the kip to assist in the lifting of the toes towards the bar. This can be done with straight legs or bent knees (and then extending knees to reach toes to bar). This unilateral toes to bar exercise can increase body control, oblique strength and muscle activation, and help a lifter gain the necessary fundamental strength needed to lift both legs to the bar (by lifting only one leg at a time, you can decrease the overall strength needed to perform the initial movement). Using tempos either during the concentric (lifting) or eccentric phase (slow lowering) of the toes to bar demands the utmost body control and core strength. This is also a good exercise to us to enhance L-sit abilities due to the similar joint actions of the hip (hip flexion). Below are three (3) toes to bar alternatives that can be done to vary programming, challenge lifters, and more. Lying leg lifts are a regressed version of the hanging toes to bar, and can be done to increase lower abdominal strength and teach the leg movement of the toes to bar. Additionally, this regression helps a lifter understand how to maintain core tension throughout the entire range of motion. 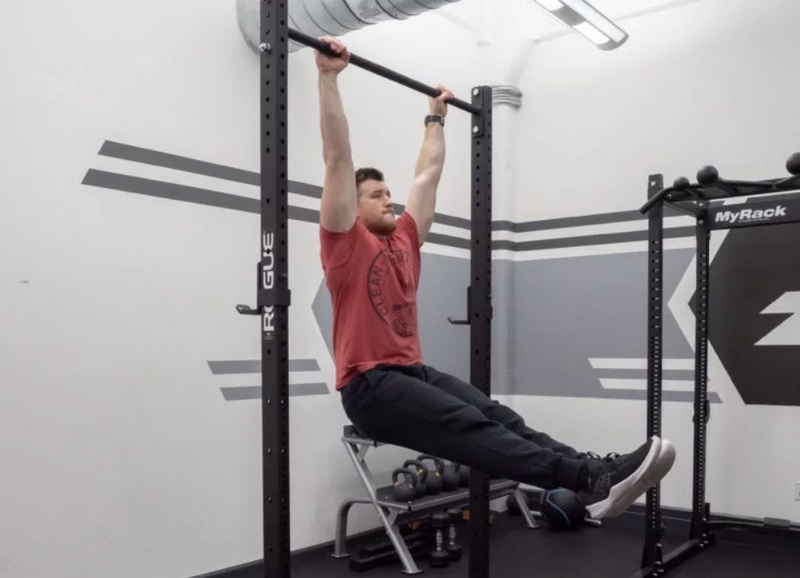 This hanging regression has the lifter perform all the same steps as the toes to bar, with just a smaller range of motion. To do this, the lifter pulls their knees to the elbows, rather than the toes to the bar. Dragonflies are a more advanced version of the lying leg raise, with the athlete lifting their hips and legs straight into the air, maintaining control, and slowly controlling the eccentric aspect of the movement. Check out some of the below articles discussing ways to increase core strength and advance your midline capacities! Should You Train Core EVERYDAY?